How can anyone sleep soundly in a pool of sweat? How can anyone relax after work in a sticky, humid living room? During the summer months, temperatures climb indoors without adequate air conditioning. In less temperate regions, the rising temperatures outside can make life unbearable. Portable air conditioners solve many problems. Unlike window units, which typically remain housed in window sills after installation, the best portable air conditioner units sit on the floor inside a room and roll to reach the areas that need the most cooling. These units are ideal for spot cooling—for added ventilation in garages, server rooms, or warm bedrooms. 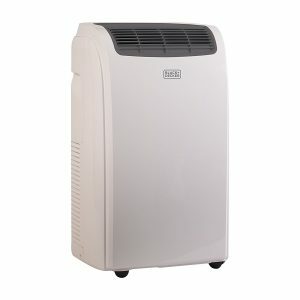 Most portable ACs are also dehumidifiers and fans. They offer a number of operating modes and speeds to best suit your needs, and they come in a range of sizes. Most even include a remote control, so you can adjust the temperatures in your room without ever leaving your recliner or your bed. We’ve reviewed the ten best portable air conditioner units on the market. Below our portable air conditioner reviews, refer to our Buyer’s Guide to better understand what specifications will be most relevant in your search for the best portable AC unit. Read our FAQ to make the most informed choice about which mobile air conditioner will work best for you! This Black+Decker Portable Air Conditioner has a 10,000 BTU rating and would successfully cool a room approximately 20 feet by 20 feet. The unit can operate as a fan, a dehumidifier, and an air conditioner. Wheeled feet make relocating from one room to another an easy task. Measuring 16.5 x 11.5 x 26 inches and weighing 53 pounds, this smaller-than-average unit can sit in a corner without drawing much attention. The exhaust hose is 4 feet and 11 inches long. Most portable air conditioners require maintenance, but Black+Decker made this unit with a slide-out filter that cleans when rinsed in water. Black+Decker also equipped this unit with a 24-hour on/off timer and a sleep mode to ensure the air conditioner kicks on and turns off whenever is most convenient for you. The LED digital display makes programming and controlling the air conditioner easy. Unfortunately, despite the product descriptions, this unit can get rather noisy. You may have difficulty hearing television or music over the running air conditioner. A remote control makes adjusting temperatures easy. Automatic timers and sleep modes help save electricity. The unit is noisy when running. As a brand, Black+Decker is a trusted household name when it comes to appliances, and their portable air conditioner model is a reliable choice for the cautious buyer. With a moderate size and a low BTU rating, this isn’t the ideal choice for large rooms or particularly hot rooms, but this unit will vastly improve a living room in a temperate climate. 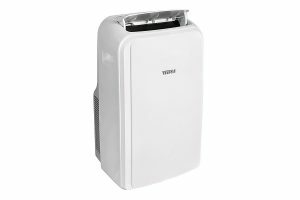 The Whynter ARC-10WB Portable Air Conditioner has a 10,000 BTU rating and is recommended for cooling spaces up to 300 sq. ft. in size. The unit can operate as a fan, a dehumidifier, and an air conditioner. It is self-evaporating, and thus requires less maintenance. Measuring 13.6 x 17 x 28 inches and weighing 64 pounds, this large unit comes with an extendable exhaust hose that reaches up to 59 inches. Wheeled feet make relocating from one room to another an easy task. The unit has a dehumidifying capacity of 55 pints per day. Temperatures can be adjusted between 62°F and 88°F. Whynter also equipped this unit with a 24-hour time, making it easy to program the unit to turn on and off at preset times. The included remote control puts the full set of controls in your hand. This unit can cease to be effective after a year of usage, however, so make sure to take care of the air conditioner and conduct regular maintenance, regardless of the self-evaporating feature. A remote control eases adjusting temperatures and preset times. The self-evaporating feature reduces need for maintenance. This unit is heavier than others. Without regular maintenance, the unit may cease to cool the room. With the lowest BTU rating on this list and a low capacity for dehumidifying, this is a great choice for first-time buyers interested in testing the limits of a portable air conditioner unit in a given space. The remote control and programmable timer combined with the self-evaporating feature make this an easy choice. 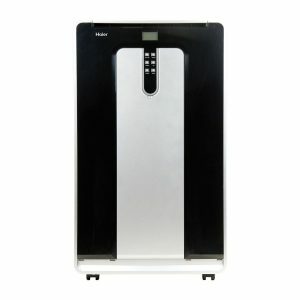 The Whynter ARC-12SD Portable Air Conditioner has a 12,000 BTU rating and is recommended for cooling spaces up to 400 sq. ft. in size. The unit can operate as a fan, a dehumidifier, and an air conditioner. It manages condensation using auto-drain technology, making it perfect for continuous use. Measuring 16.5 x 20 x 34 inches and weighing 45 pounds, this lighter-than-average unit comes with a dual exhaust hose that reaches up to 60 inches. Wheeled feet make relocating from one room to another an easy task. The unit has a dehumidifying capacity of 96 pints per day. Temperatures can be adjusted between 61°F and 89°F. Despite the auto-drain feature, water can still build up in this unit, especially in areas with high humidity levels. If this water leaks out of the air conditioner, it could damage the floor beneath it. Dual hose operation for optimal exhaust. A remote control allows for easy temperature control. Auto-drain feature reduces need for maintenance. This unit is particularly light. This unit is noisy when running. Without maintenance, the air conditioner may leak. As one of the lightest units, the Whynter 12,000 BTU Dual Hose Portable Air Conditioner is a great option for anyone looking to avoid regular maintenance on their AC. Its dual hoses optimize exhaust and cooling, making this a robust air conditioner considering the lighter-than-average weight. Its 12,000 BTU rating is respectable and would cool a large space than some other models. The EdgeStar Extreme Cool Portable Air Conditioner has a 12,000 BTU rating and is recommended for cooling spaces up to 425 sq. ft. in size. The unit can operate as a fan, a dehumidifier, and an air conditioner. It manages condensation using auto-drain technology and includes a washable pre-filter and a replaceable carbon filter to help control odors and pollutants. Measuring 15 x 17.2 x 31 inches and weighing 69 pounds, this hefty unit comes with an air exhaust hose that reaches up to 55 inches. Wheeled feet make relocating from one room to another an easy task. The unit has a dehumidifying capacity of 90 pints per day. Temperatures can be adjusted between 61°F and 89°F. Whynter also equipped this unit with a 12-hour timer, making it easy to program the unit to turn on and off at preset times. The included remote control puts the full set of controls in your hand. Despite all of that, many consumers note that this model can break rather easily, even after a few weeks of usage. May not cool rooms as well as indicated in product descriptions. May break or cease to operate after a few weeks or months. 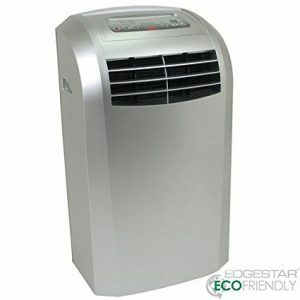 The EdgeStar Extreme Cool Portable Air Conditioner has an impressive dehumidifying capacity of 90 pints per day, making this one of the more exceptional dehumidifiers on the list. If you’re more concerned with soothing allergies and sapping moisture out of the air than with a 24-hour timer, this unit is the best for you. The Tripp Lite Portable Cooling Unit Air Conditioner SRCOOL12K has a 12,000 BTU rating and is recommended for cooling spaces up to 500 sq. ft. in size. It also dehumidifies and filters the air. Though other units in this list are ideal for cooling small residential spaces, the Tripp unit is best suited for cooling server racks and heavy duty equipment. A 6-foot-long flexible cooling duct directs cold air exactly where it’s needed and can be connected at the top of a rack enclosure door. However, the louvered cooling vent can also provide air conditioning for a small room or network closet. The unit is self-evaporating and requires next to no maintenance. Measuring 19.9 x 11.8 x 30.6 inches and weighing 74 pounds, this unique unit comes with wheeled feet and plugs into a standard 15-amp outlet. This unit does not come with a remote control. A remote management accessory is sold separately. Can blow cold air directly where needed using the 6-foot-long flexible duct. Requires next to no maintenance thanks to self-evaporation. Does not come with a window installation kit. 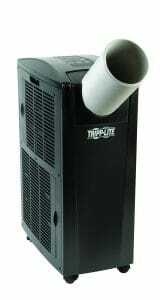 The majority of portable AC units listed here are ideal for residential environments, but the Tripp Lite Portable Cooling Unit Air Conditioner seems specifically designed for IT environments. If you manage a rack of servers that keep overheating, the flexible cooling duct on this unit is meant to direct cold air exactly where you need it. Though the lack of a remote control would be a drawback of a residential unit, if you mean to leave this alone while it operates in a network closet, the lack of a remote will not pose a problem. 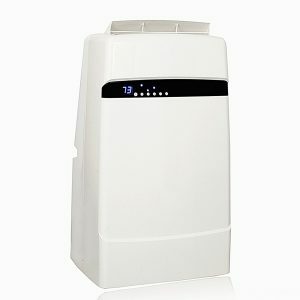 The Haier HPN14XCM Portable Air Conditioner has a 14,000 BTU rating and is recommended for cooling spaces up to 500 sq. ft. in size. It offers three cooling settings, three fan settings, and dehumidifies the air. Measuring 20 x 33.6 x 16.6 inches and weighing 83 pounds, this large unit comes with a single exhaust hose that installs easily in the average window and wheeled feet. A sleek and attractive design makes this one of the prettier models out there. Haier also equipped this unit with a 24-hour time, making it easy to program the unit to turn on and off at preset times. The included remote control puts the full set of controls in your hand. Some consumers face difficulty with the connection between the exhaust hose and the window vent. The connection can sometimes be less secure than desired. Multiple cooling and fan settings. Loose connection between exhaust hose and window vent. 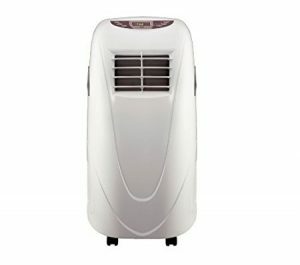 The Haier HPN14XCM Portable Air Conditioner is one of the more beautifully designed models on this list. If you want an attractive looking unit to mesh with your current decor, the Haier should be the first unit you appraise. Its multiple cooling and fan settings paired with its 14,000 BTU rating make this portable air conditioner a smart investment. 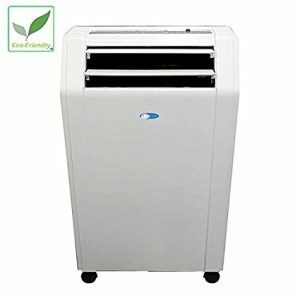 The Global Air Portable Air Conditioner Cooling/Fan has a 10,000 BTU rating and is recommended for cooling spaces up to 300 sq. ft. in size. It offers two different speeds of cooling, a fan, and four-way air direction for optimized cooling of the space. Measuring 17 x 13 x 31.3 inches and weighing 54 pounds, this moderately-sized unit comes with wheeled feet and no water tank. This Global Air model is self-evaporating and uses condensation to enhance its cooling abilities and to save energy. The included remote control permits you to manage the unit and its temperatures from across the room. The two-piece window kit and exhaust hose will fit into windows up to 52 inches in length. This offering from Global Air does tend to make a lot of noise when buttons are pressed and chimes loudly when it shuts off. Other models may be more discreet when temperatures are being adjusted. Offers two speeds and four-way air direction. Buttons can make too much noise. Automatically shuts off when self-evaporating feature kicks in. As one of the lower-priced models in its class, the Global Air Portable Air Conditioner offers a respectable 10,000 BTU rating along with multiple fan speeds and four-way air direction. Though it will not suffice in larger spaces, up to 300 sq. ft., the Global Air will pull its weight and satisfy the cooling needs of anyone holding on to its remote control. The Titan TT-ACP14C01 Portable Air Conditioner has a 14,000 BTU rating and is recommended for cooling spaces up to 550 sq. ft. in size. It offers four operational modes, including automatic, cooling, dehumidifying, and fan. The fan comes with three adjustable speeds. The unit has a dehumidifying capacity of 71 pints per day. Measuring 15.6 x 18.3 x 30.1 inches and weighing 73 pounds, this unit is self-evaporating and requires minimum manual draining. The TT-ACP14C01 comes with a plastic window kit and an extendable exhaust hose reaching up to 4.9 feet. Titan also equipped this unit with a 24-hour time, making it easy to program the unit to turn on and off based on your preferred schedule. The included remote control puts the full set of controls in your hand. The two-piece window kit and exhaust hose will fit into windows up to 52 inches in length. Rarely requires draining thanks to self-evaporating feature. Offers four operational modes and three adjustable fan speeds. The high-powered Titan TT-ACP14C01 Portable Air Conditioner is a versatile unit with four different operational modes and three adjustable fan speeds. Its dehumidifying capacity reaches 71 pints per day, and its self-evaporating features make it easy to maintain. With a high BTU rating of 14,000, this unit would be a good choice for anyone needing to cool a space up to 550 sq. ft. The Commercial Cool Portable AC Black has a 12,000 BTU rating and is recommended for cooling spaces up to 550 sq. ft. in size. It offers three fan speeds, three cooling speeds, and a dehumidifier mode. Measuring 35 x 22 x 19 inches and weighing 72 pounds, this unit is self-evaporating and requires minimum manual draining. It is mounted on four caster wheels and moves easily from room to room. This model from Commercial Cool utilizes a single exhaust system and includes window kit for easy installation. The unit has a dehumidifying capacity of 61 pints per day. Temperatures can be adjusted between 62°F and 88°F. Commercial Cool also equipped this unit with a 24-hour time, making it easy to program the unit to turn on and off based on your preferred schedule. The included remote control puts the full set of controls in your hand. While some units shut off once the room reaches the desired temperature, this unit runs continuously regardless of the temperature in the room. As a result, the unit may waste some energy. Offers three fan speeds and cooling speeds in addition to a dehumidifier mode. Runs continuously regardless of room temperature. Dehumidifying capacity is fewer pints per day than other models. The Commercial Cool Portable AC is a great mid-range unit with a 12,000 BTU rating. Its three fan speeds and cooling speeds operate at an ultra-quiet level, making this unit perfect for bedrooms that need a little extra ventilation. Thanks to its self-evaporating feature, you rarely have to bother with it after turning it on—except to turn it off once your room gets as cool as you like. The Portacool PAC2K482S Portable Evaporative Cooler features a design unlike any other on this list and can cool spaces to astounding temperatures. Measuring 75 x 88 x 36 inches and weighing over 400 pounds, this massive and heavy-duty evaporative cooler can lower temperatures to 15°F in rooms up to 4,000 sq. ft. in size. Despite its weight, sturdy caster wheels making moving the unit feasible. This model from Portacool has two speed settings and uses a garden hose connection to accommodate its 40-gallon capacity. The unit makes use of tap water to keep spaces cool. As a portable air conditioner, this luxury unit would be better suited to a warehouse than a residential structure. Considering its price tag and its capacity, this unit is an excessive choice for anyone looking to cool their bedroom in the summer time. Cools rooms up to 4,000 sq. ft. in size to 15°F. 40-gallon capacity with a garden hose connection. 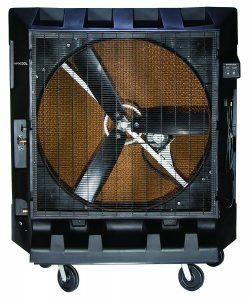 While the other units on this list are moderately priced and suitable for residential or small business spaces, the Portacool PAC2K482S is a massive, heavy, high-powered evaporative cooler better suited for enormous, 4,000-sq-ft spaces. Its incredible ability to lower temperatures to 15°F makes it an effective, efficient cooling system where central AC is unavailable. Of the top 10 best portable air conditioners, we’ve selected three editor’s choices: one for residential, one for IT, and one for design. The Whynter ARC-12SD is a light, low-maintenance option that we consider to be ideal for residential use. Its moderate BTU rating and self-evaporating features would make a great AC unit for a bedroom or living room. The Tripp Lite SRCOOL12K is our choice for server rooms and IT environments. Its flexible cooling duct makes this a perfect unit for cooling server racks or other hot-running appliances. The Haier HPN14XCM is a beautifully designed unit that we think would be an excellent addition to any carefully designed space. Its attractive external shell looks more fashionable than other, simpler options. As one of the most important modern inventions, the air conditioner cools our homes, our places of business, and most other structures in warmer climates. A portable air conditioner cools spaces without the permanent installation of a central AC unit. To separate the cool air from the warm air, AC units have to vent exhaust into an external space. Portable air conditioners typically install through an extendable exhaust hose that vents through a window. Portable air conditioners should be held to high standards, as the exhaust impacts our environment. 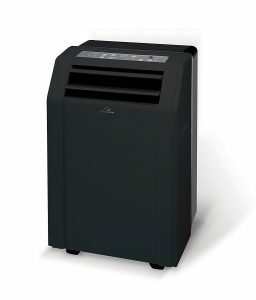 How do I know if a portable air conditioner can keep my room cool? First, determine the square footage of your room. Do this by multiplying the length of the room by its width. Next, take a look at a few different portable air conditioners and determine their BTU rating. This rating indicates the amount of heat an air conditioner can remove from the room. The higher the number, the more powerful the air conditioner. Typically, an 8,000-BTU unit will effectively cool spaces up to 200 sq. ft. A 10,000-BTU unit will cool spaces up to 300 sq. ft. A 12,000-BTU unit will cool spaces up to 400 sq. ft. And a 14,000-BTU unit will cool spaces up to 500 sq. ft.
What’s the difference between a single-hose AC and a dual-hose AC? A single-hose air conditioner draws air from the surrounding space, cools it, and vents a majority of the cool air back into the room. Some of the air will also be used to cool the unit itself. This fraction of the air will heat up and then be vented through the single exhaust hose into the external environment. The benefit of a dual-hose air conditioner is that unlike a single-hose air conditioner, it does not create any negative pressure inside the room being cooled. In this way, a dual-hose air conditioner is more efficient but can sometimes be less effective. What other features do portable air conditioners have? Timer and temperature controls help you save energy by programming your unit to turn on and off at specific times or temperatures. Remote controls help you adjust the unit’s settings from afar. Self-evaporating and auto-drain features help you avoid laborious maintenance—air conditioners without these features must be regularly drained of condensation buildup. Most portable air conditioners are also dehumidifiers, which can help clean and filter the air for people prone to allergies. What are some typical concerns and complaints about portable air conditioners? Sometimes, these units can be noisy. If you’re working to ventilate a hot bedroom, the added frustration of a noisy air conditioner can further interrupt sleep. Some brands tend to be more fragile than others. Read reviews and know whether or not continual use will limit the unit’s longevity. Portable air conditioners without self-evaporating or auto-draining functionality can be a pain to maintain. This vastly depends on the unit you purchase and its accompanying instruction manual or owner’s manual. However, most units will need to be set up near a window with a power outlet in reach. You’re unlikely to need any tools beyond a screwdriver, as most window kits allow for easy installation. Carefully connect the exhaust hose to the window panel to ensure no hot air leaks into the space you want to cool. If you need to conduct maintenance on your unit, such as draining condensation buildup, unplug the air conditioner. Portable ACs are particularly useful for renters, as they allow for additional air conditioning without needing to convince a landlord to invest in expensive appliances. For garages and server rooms, the additional ventilation and cooling can be invaluable. For those with allergies, the dehumidifying capacities of portable air conditioners can ease seasonal suffering. With a portable air conditioner, you can create a comfortable environment almost anywhere. These appliances are the ideal climate control when you need a more temporary and versatile solution than a fully installed central cooling system.